Released Tuesday, Nov. 27, the collectible includes an uncirculated quarter from the Philadelphia and Denver Mints and a proof quarter from the San Francisco Mint. In its latest report, the U.S. Mint published sales data for 158 numismatic products. Eighty-nine products outperformed their prior weekly gains against 69 previously. 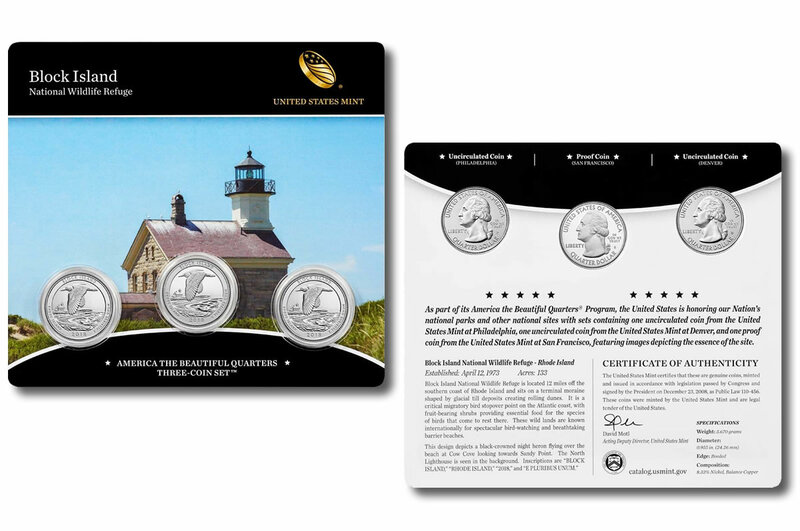 Not counting the new Block Island Quarter Three-Coin Set so as to compare apples to apples, 8 products increased by more than 1,000 units against 7 in the previous report. One product saw its sales reduced, the 2017-S Frederick Douglas Quarter Rolls shed 1, compared to zero in the previous report. Below are tables showing the latest sales for U.S. Mint numismatic products. The sales period covers from Nov. 26 to Dec. 2. Products with an asterisk (*) are no longer available or had no reported sales.